In the discussion on mass, weight, and center of gravity, we introduced the idea of weight transfer and how the amount of weight on each wheel of the motorcycle changes as the bike accelerates, brakes and turns. 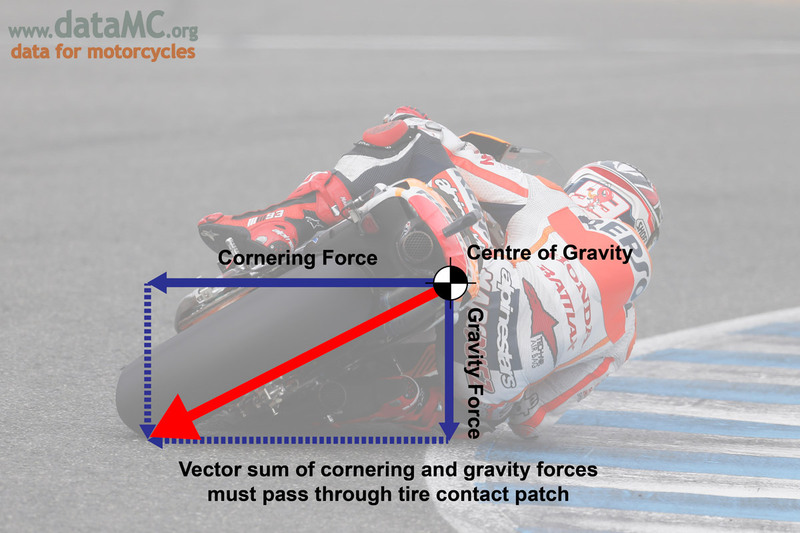 The first step in determining values for that weight transfer is to calculate how the total weight of the bike changes during cornering. Note that “weight” here refers to the weight or force of the motorcycle along an axis parallel to the lean angle of the motorcycle, and not perpendicular to the ground. 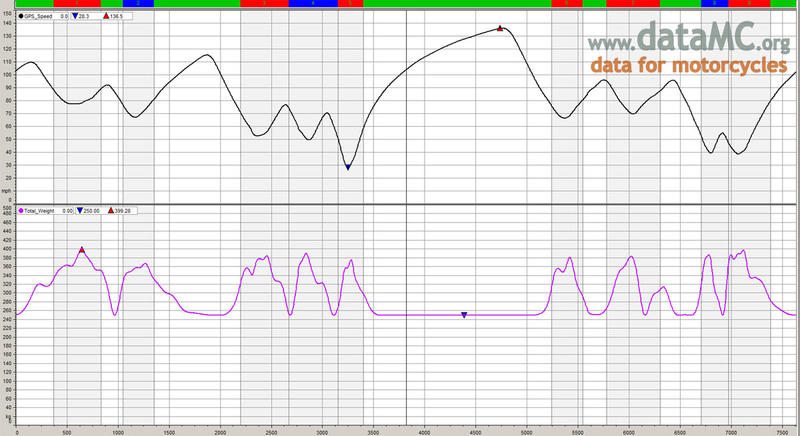 This will provide an estimate of the total load on the suspension, which can be further refined using other GPS data. 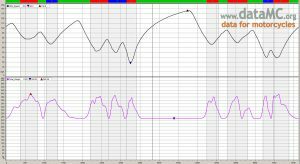 This chart shows speed (black) with total weight (purple) for a typical lap. Not on straights that the total weight is close to the static weight of 250 kilograms. In high cornering load situations, total weight can be as much as 400 kilograms. Here, we are concerned with the total weight of the bike; the easiest way to visualize this is to consider the motorcycle still has a scale under each wheel to measure weight. 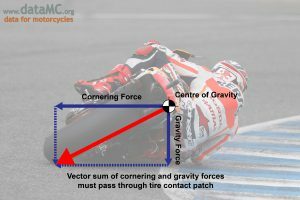 As the motorcycle corners, lateral acceleration adds weight in the horizontal direction. Using vector addition, this can be added to the static weight of the bike, in the vertical direction, to give the total weight acting along the axis of the bike. Note that this approximation does not take into account camber effects or changes in elevation. Here we are most interested in a useful approximation for total weight, and will address those effects and how to incorporate them into the calculations using other GPS data in a later post.